It is with heavy heart that we say farewell to Curtis Mueller (a.k.a Doobjanka), WarcraftPets' community leader for the past 6+ years. It was 2009 when Doobjanka joined the WarcraftPets team. He'd caught my eye as our leading pet collector for many months. As I got to know him, I knew he'd be the perfect candidate to lead our growing community. 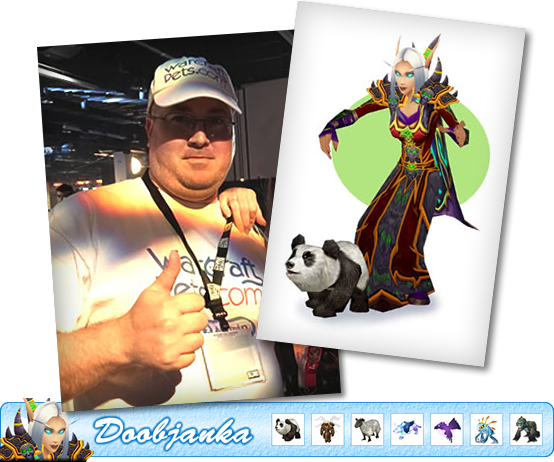 Throughout the years, Doobjanka has accomplished much for WarcraftPets. He initially signed on to field questions and account-related issues, but he's achieved so much more than that throughout his tenure. Doobjanka ran our site contests, manned our Twitter and Facebook accounts, and helped manage our forums. Later he would host our BlizzCon Meet-and-Greets solo, always eager to engage fans of the site in person. His passion for pets was grand – he could talk for hours on the subject and tell engaging stories about his adventures. He knew WoW pets like the back of his hand. But Doobjanka's greatest legacy is something he did all on his own. In 2012, he created the WarcraftPets family of guilds. He recognized the need to bring fans of the site together in-game and took it upon himself to make that happen. Without Doobjanka, guilds like WarcraftPets, Magical Menagerie, Pet Peeves, Littlest Pet League and Dead Mole Society wouldn't exist today. While I'm saddened by his decision to step down, I completely understand and applaud his choice. He's ready to move on and enjoy other aspects of his life. I know that if he approaches those things with even half the enthusiasm and optimism that he brought to WarcraftPets, he'll be wildly successful. If you'd like to say your own goodbye to Doobjanka, feel free to do so in his goodbye post in our forums, or leave a comment below. I know we'll all miss him. For the time being, I'll be covering for Doobjanka in the spare time I have. But I'd love to bring on another volunteer to take up the cup of being WarcraftPets' new community leader full time. If you're interested in becoming WarcraftPets' new community leader, keep watching our news feed. Within the next week or two we'll post details about the position and how you can apply. Many thanks even from germany..
As a member of the guilds you bega, I can say that your time and efforts on behalf of we pet lovers are always going to stay with us as a lasting tribute to you! Good fortune to you in your next venture and thanks for the time you gave us! Doob, a million thanks for your hard work throughout the years! I was fortunate enough to have met you at Blizzcon(attended 5 and spoke with you at 2..I can't remember which years! lol!). My first conversation with you inpired me to join <Warcraftpets> on Madoran. You personally gave me bags and gold to help my little baby toon! The guild collective you have built is truly amazing! I enjoyed my time there so much that I will be moving my Horde toons back soon. Best wishes! Take care Doobjanka. Wishing you all the best in your future endeavors. Thanks for everything. Wishing you well in your future endeavors...:) Thank you so much for your contributions to Warcraft pets!!!! Good luck in your future endeavors and thanks for all your hard work. Thank you for everything that you've done for our pet battling community. The time and effort you put into everything pet-related is simply astounding and we honestly cannot thank you enough for that. Best of luck to you and your new wife (and get her to start playing WoW soon! Entice her with the pets. lol). I am really new to this and would not have done as much without your help. Thank you for compiling all this! Have fun in your new endeavors! Thanks for everything, Doobjanka. You did so much! You will definatley be missed. It's amazing what you've done in promoting the pet world of WOW! Thanks so much and know you are truly appreciated. Congratulations on your good news! All the best to you and yours! Although I've never had direct contact with you, I appreciate the tremendous amount of work you've put into Warcraft Pets. It has meant a lot to me to have this site, it has been an inspiration to me to keep going, after guilds and guildmates gradually fell away from the game. Thanks for everything and best of luck in whatever you choose to do in the future. just wanted to say, will miss you but hope your future is bright and hopefully you will be back. Good luck. You will be missed. He seemed very knowledgable and certainly created a lot! While I don't know you nearly as well as many others here, I have always been so impressed by your sense of your humor, kindness, dedication and general even-keeled approach when we have interacted. Congratulations on your upcoming nuptials! My wishes for great happiness for you both, and hope to see you both in game eventually. If your future wife, ever needs a spare tank, healer or whatever to help through dungeon runs (although I'm sure she'll never run short), I'd love to help.